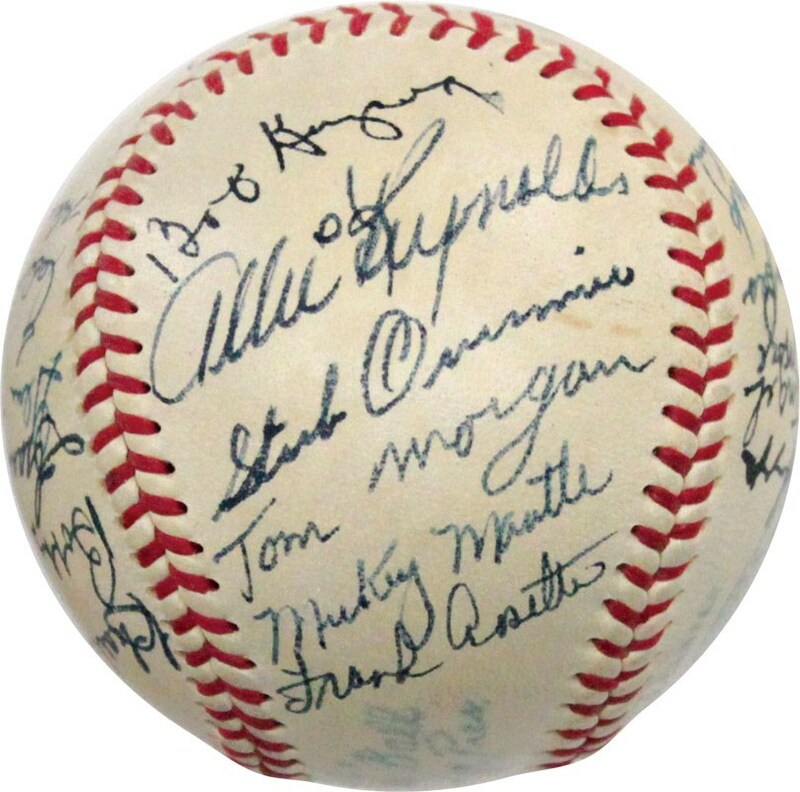 One of the most coveted championship team signed balls continues to be a 1951 N.Y. Yankees baseball that includes authentic Joe DiMaggio and Mickey Mantle (rookie) signatures, with this awe-inspiring offering possibly portraying the finest aesthetics of any existing 1951 Yankee team signed balls. Who could have possibly imagined that when the immortal Joe DiMaggio was ready to hang up his cleats after the 1951 season, an emerging young star with Goliath like supernatural power would be ready to fill "Joltin Joe's" hallowed centerfield position. That Oklahoma-bred phenom was the legendary Mickey Mantle, and his majestic exploits on a baseball diamond including his incredible tape measure home runs will surely echo for eternity. No Hollywood screenplay could possibly match that magical 1951 New York Yankees championship year with one baseball icon "passing the baton" to another. At the start of the 1951 season, the New York Yankees were already in the midst of baseball's greatest championship run, already having claimed two World Series victories in 1949 and 1950, only to add three more years to their remarkable record of five consecutive championships. The quiet leader of this virtually unbeatable ball club was still Joe DiMaggio, yet the "Yankee Clipper's" skills were slowly beginning to diminish due to a run of injuries over the past several years. Simultaneously, word was spreading like a wildfire of an almost "godly" like superstar from Commerce, Oklahoma named Mickey Charles Mantle. Nicknamed the "Commerce Comet" due to his blinding speed, Mantle left his minor league Joplin, MO. team to join the Yankees at the beginning of the 1951 season. DiMaggio called Mantle the greatest prospect he ever saw, and although Mantle had to be sent back to the minors for a brief period due to a serious batting slump, he eventually returned for good to become one of our National Pastime's all-time icons. History was now in the making with BOTH DiMaggio and Mantle playing the outfield together with what would eventually become "Joltin Joe's" final season. In typical fashion, the Yankees steamrolled to another World Championship, with DiMaggio exiting the game as the winner he was born to be, and Mantle claiming the first of his eventual seven championships. Since these two Hall of Fame icons only played a single season together, their names could only be linked together on the 1951 Yankees Championship team signed ball. 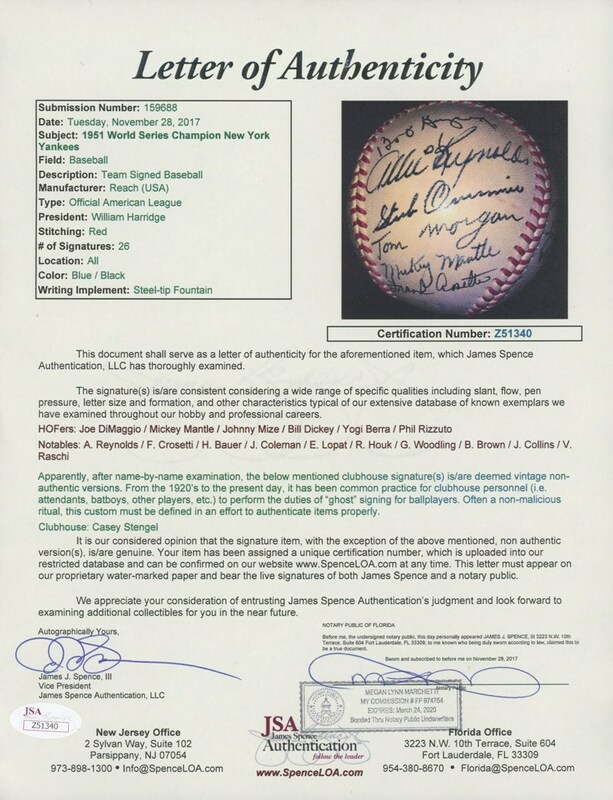 This explains why in the memorabilia circuit, a 1951 Yankees signed baseball resides as one of the most highly sought-after collectibles. 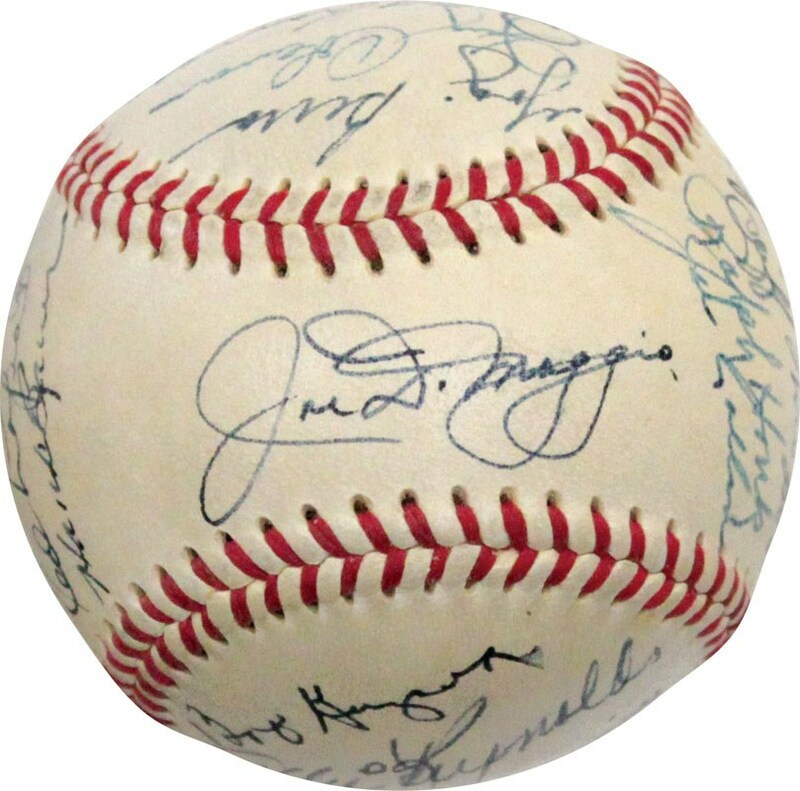 Consider that its extremely fortunate owner possesses a ball that represents Joe DiMaggio's final season as well as Mickey Mantle's rookie season! 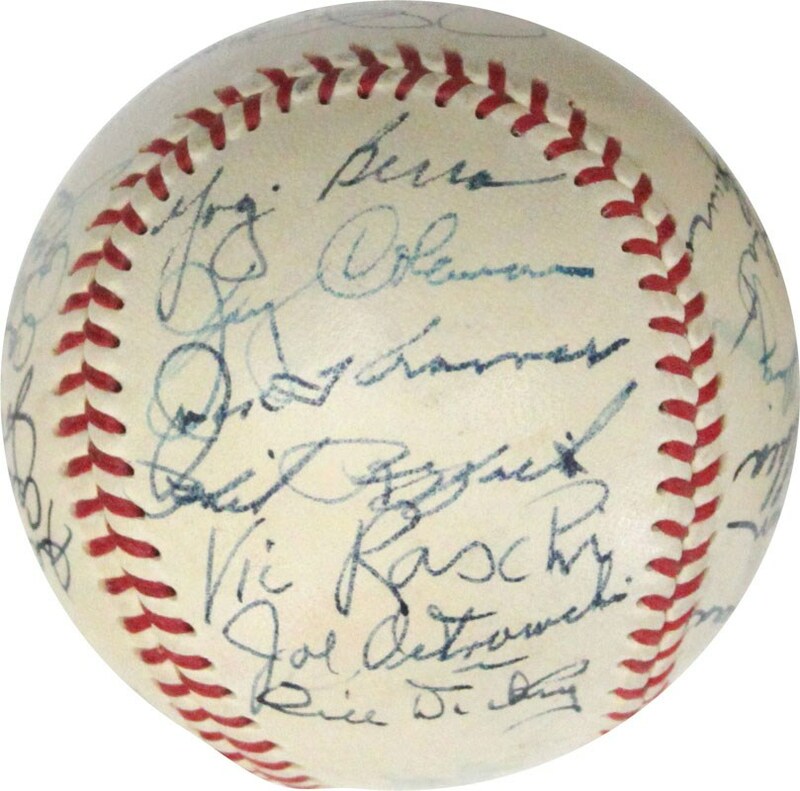 Unfortunately, a myriad of these balls circulating in the hobby carry significant "clubhouse" signatures whereby a clubhouse attendant signed for the unavailable players, with many of those unauthentic signatures representing either Joe DiMaggio or Mickey Mantle. 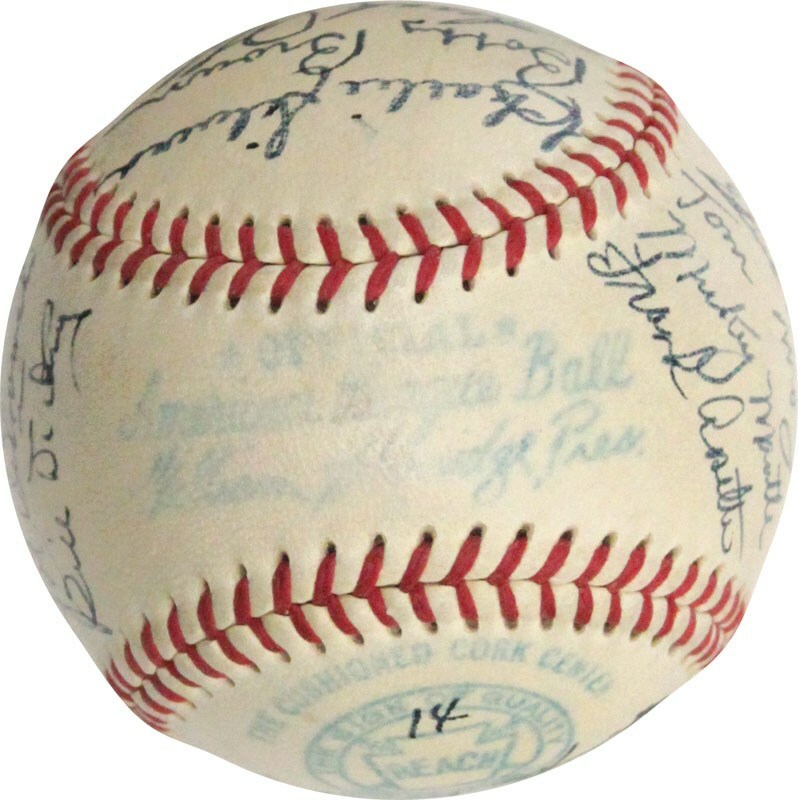 An additional issue with vintage team signed balls is the significant number of light signatures donning the baseball due to more than a half-century of potential fading/wear. 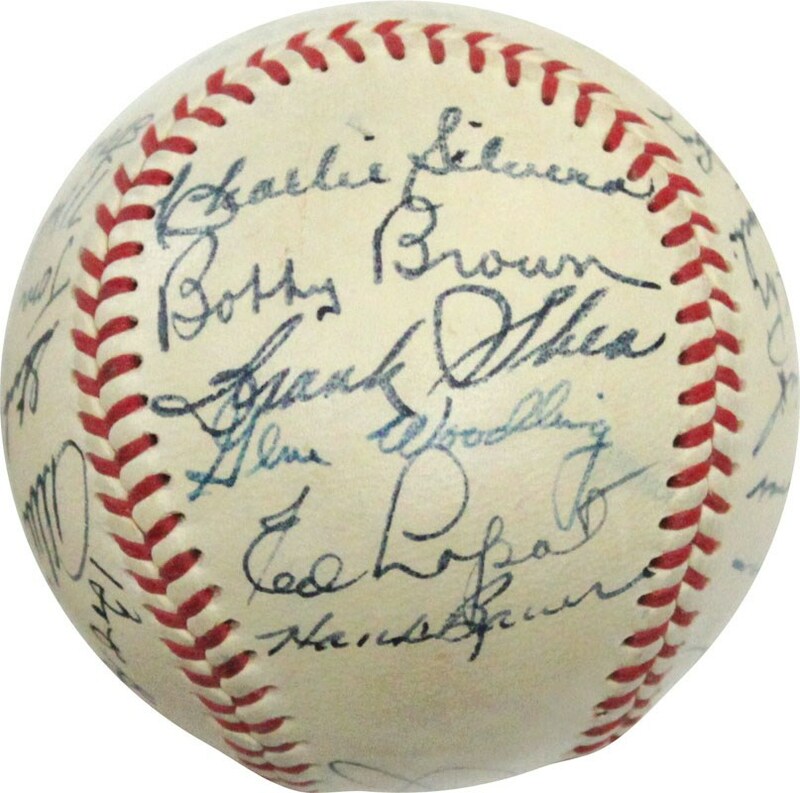 With that in mind, Memory Lane is extremely proud to present what arguably stands as the finest 1951 New York Yankees team signed baseball extant; including an incredible Joe DiMaggio vintage autograph on the sweet spot and a likewise sensational Mickey Mantle rookie era signatures on the south panel! The ultra-desirable vintage "Joe DiMaggio" autograph depicts solid "8/9" strength with the legendary Mickey Mantle script also portraying "8/9" quality. 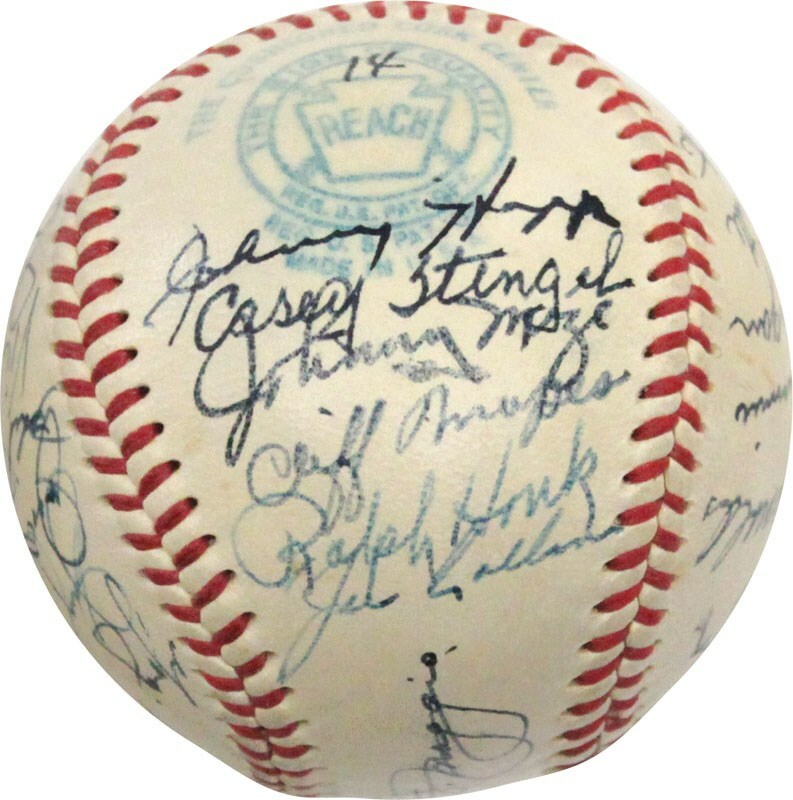 There are 25 "authentic" signatures in all, with the Casey Stengel (26th signature) typically scripted by a clubhouse attendant (virtually ALL 1951 Yankee balls include a clubhouse Stengel).